There’s one thing I forgot to mention about this whole real food on a budget project. Yes the food has to be “real” and yes it cannot exceed $125 a week, but the other part I’ve neglected to mention is that it must also taste good too! I might have overlooked the importance of this issue before, but as of late I’ve decided this is a must for me. I absolutely cannot eat just for sustenance. I cannot eat the same thing over and over again. And I struggle to be satisfied with a meal that feels like it is just a bunch of random things thrown together. Unfortunately I am finding that meeting this latest requirement could very well be the hardest part of all when it comes to having a budget drive our choices! All of this is top of mind after our dinner last night. For the better part of yesterday afternoon, the back of my mind was occupied with what in the world we could possibly eat for dinner. I was experimenting with not going to the store at the start of my budget week (like I normally do) and instead trying to “survive” by eating what we had on hand. Yes, “surviving” may sound a little dramatic, but that is how it feels! Monday night wasn’t so bad, but then last night every dinner option I could think of had some sort of roadblock. I was originally thinking fried rice or stir fry (which, by the way, can be a great meal when you are trying to make a bunch of random stuff something special). But then I realized we did not have an onion, and I just couldn’t imagine starting the dish without that key ingredient. Next, I thought I could somehow incorporate fettuccini alfredo since I happened to have some cream on hand, but then I realized my supply of paremsan cheese was next to nothing (which is necessary for that dish). Then after spending som e quality time in the back of my freezer I discovered some whole grain polenta that I’d forgotten about. We hadn’t made polenta in a very long time and most importantly it sounded good. But, yikes…how in the world could I make a complete meal out of it??? My husband is normally creative in the kitchen, but he was no help. And everything that I thought would be fabulous with polenta (mushrooms, sausage, shrimp, onions!, spaghetti sauce) just did not exist in our house. So in an effort to “save” dinner as best I could I made a smoothie to go with it. 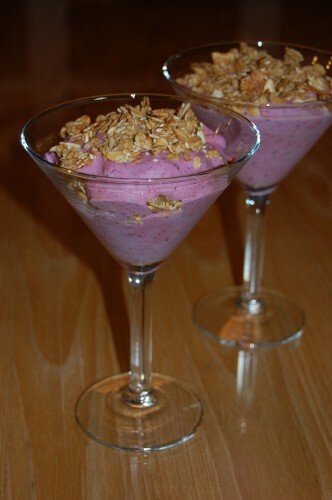 Not just any smoothie though…a smoothie layered with (what was left of) our granola in fancy martini glasses. I just had to do something to make dinner appealing, and luckily our cute little daughters were very excited about the outcome. Because yes, I even let our THREE-year-old carefully eat hers out of a breakable martini glass too. They thought it was pretty special though, and even though parfait smoothies and polenta (topped with spinach) don’t at all go together…I was honestly relieved that we were not just eating for sustenance because meal time can be (and should be) so much more than that!! This was my first time budget shopping for real food at Bi-Lo and while they did have some decent organic choices, I didn’t think their non-sale prices were anything to write home about. They have a store very close to us though so it might be a good “last minute” store alternative to our usual Harris Teeter, but overall the pricing does not make it worth my time to shop there. Not to mention the amount of “non-real food” products at their store that I have to weed through to get to the good stuff. I’m glad my family’s not alone with insisting on variety. I commend you for being able to eat granola for as long as you have been. We love your granola recipe but can only eat it for a couple weeks before being ready to move on (but we always cycle back to it eventually). Thanks for combining your blogs, it makes finding recipes and keeping up with your current blog much easier! Keep up the good work! I keep waiting for us to get tired of the granola, but for some reason it never happens. We have had to take breaks (albeit short ones) from the hummus and tortillas though even with as much as we love them! Thanks for your comment! Have you tried coupons at all? I am also attempting to keep to a similar budget, inspired by your journey and found that while there are not very many real food coupons out, there are a few. If you go to the websites of the products you buy you can often print out a coupon. Stony field has great ones and if you use their rewards system you can quickly earn points for free yogurt. Just a thought. I have tried cutting coupons from the Sunday paper to end up finding next to nothing. I think I could do a better job with searching for specific product coupons online though (like you mentioned with stoneyfield yogurt) so I am going to work on that! Thanks so much for the comment! I also love lara bars. But they can be pricey. You can make your own from dried fruit and nuts. That’s what nice about real food, it actually CAN be made in your home kitchen. In this post I made lara bars shaped into balls so that they looked like candy truffles. But you could just as easily shape them into bars. I spent less money and because I used organic dates and almonds I knew I was staying true to the whole organic thing. I also wanted to comment that I appreciate you posting so frequently. You’re keeping me going! I wanted to ask though, how are you doing on meat and grains? I’ve noticed that you haven’t purchased much that I can think of since you’ve been on the budget. This week I had the opportunity to purchase 5 whole, local, organic chickens but that killed my budget for the week at $60. But it’s such a relief to have them in the freezer. Thanks for the comment and recipe! I haven’t been purchasing a lot of new meat b/c I am mainly pulling what we already own out of our freezer and then “charging” myself for it since most of it was purchased pre-budget. Oops. I take that back. I just noticed the bag of flour. Are you going to try making your own bread?? We just started that. A bit time consuming and tricky at first, but definitely worth the satisifaction. Yep! I know what you mean! Making our own bread has been an exasperating experience, but I think we’ve finally got it down. How did my grandma make it look so easy?! LOL!! Oh, we love polenta and greens too! I have a button for a healthy snacks ebook on my sidebar – it has recipes for real food Lara bars (homemade) with lots of varieties. I don’t notice a lot of variety in your food – both in the recipes and in the items you purchase from the store. 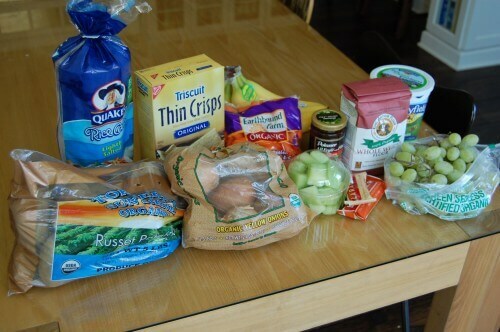 It seems like it’s always grapes, bananas, triscuits, stir fry, eggs, granola. My husband and I eat nothing but “real” food, and we rarely eat the same meal in a month. Our food budget is $80 per week for the two of us, and I’m under quite often. At any given time I will have over 40 different types of fruits and vegetables in our house, and it’s not uncommon for us to have 7-10 different types incorporated in meals throughout the day. Right now broccoli, beets, cauliflower, Brussels sprouts, leeks, carrots, celery, cabbage, eggplant, cranberries, lettuce, pears, parsnips, potatoes, squash,spinach ,mushrooms and sweet potatoes are all in season, so they are less expensive. I love what you are doing, both in the budgeting and in the real food movement, but I worry that the more ruts you are stuck in, the less likely you or your children will be to stick w/this lifestyle. It’s also – and this is just my opinion – healthier to have a more varied diet. Studies about the increase in food allergies have looked at the fact that people don’t eat in season, and that they eat the same things over and over again, so their bodies build up a sensitivity to the foods. You seem to have a large amount of whole food recipes etc, you should start a food blog as well and share your recipes. I’m always excited to find new healthy recipes! Awww man and I thought I was being creative by purchasing “thin crisp” Triscuits instead of original! LOL I do think I could try a little harder at being adventurous, but to echo what Sherry said it is a little harder with kids if you want to make one meal that you know everyone will eat. I am lucky that my kids are pretty good eaters (and not necessarily b/c they were born that way…we try very hard with them w/o pushing too far of course! ), but I often have to pass over recipes like thai green curry, blackened chicken, etc. that I know my husband and I would love b/c I don’t want to chance it with the kids on a budget. There is little room for error when money is so tight! I also see all sorts of produce items that I would love to buy (other than the usuals) but I can only seem to find those items in organic at Earth Fare and it isn’t cheap. I think since I’ve been trying a few different mainstream stores each week they usually all have the same limited organic options (like grapes, apples, etc.). I also regularly go to our Farmer’s Market and most of the vendors there are selling similar stuff right now since it is all local and in-season. I agree that a varied diet is best though and I definitely have room for improvement so keep the ideas coming! And one question – we used to eat risotto all of the time, but I have yet to see “whole grain” risotto for sale. Did you find some? Well, I’m a foodie first, and a real foodie second, so I have not attempted to make risotto with anything other than traditional arborio rice. I use brown rice when I can, but sometimes (for me) it is not worth the sacrifice in taste and texture, especially in dishes like risotto. I’d like to think that I make up for it, at least a bit, in making dishes like risotto w/added veggies and herbs. I have read that you can make an acceptable (though possibly not fantastic) risotto w/short grain brown rice. Maybe I’ll give it a shot. I printed the dirty dozen list, but I guess my true feelings are that I really prefer for absolutely everything to be organic (if possible). So if for some reason I cannot find a particular item in organic (or cannot afford it to be organic) then I am checking the list to make sure it is not one of the dirty dozen before I buy it conventional. Also, thanks for letting me know about the apples! I am reading back through your archives as I begin to make an extra effort to remove the processed food from my family’s diet. I don’t see us going to 100% real food, but we’re definitely making an effort. I just wanted to mention that you can make a delicious “risotto” with barley. There is a recipe in “Eating Well When You’re Expecting” for risotto made with barley. I don’t have it in front of me, so I can’t check to see if it is real food approved, but I remember it being really good! Thanks for the inspiration to continue on this journey! I can see your point Rachel, but you mentioned only yourself and your husband. Its important to note that the author of the blog has small children, and small children CAN be introduced to new tastes and foods, but you had better have the staples they like in the house as well. Some tastes take time to acquire and children’s palates are not developed enough at some stages to acquire a fondness for many foods. Keep trying, yes of course, but some three year olds will eat Brussel Sprouts and some just will not. Kale is another good example, to most very young children it just tastes bitter and they wont eat it. The old “you get nothing else til you eat that” that our mothers and grandmothers advised does not work, all that does is convince a child that food is a battleground. I have four kids and two grandchildren, I recommend the “everyone has to take three bites” rule, with no substitutions allowed at that meal. If a kid hated it, but made a real effort, I wont present it again for awhile. Hello Rachel! I just started reading Lisa’s blog/100 day Pledge. I am trying to switch over from all the processed foods for several reasons so when I saw you have some really good sounding recipes in addition of Lisa’s I think I can handle it. So if you could please send me some of your recipes I would really appreciate it. Because I have a very tight budget about $40 a week for 2 (a teenage son who is still growing) I find myself making the same stuff over and over again. I do make a lot of my own casseroles or soups and am back backing homemade wheat bread I still would more recipes! Thank you so very much~! You know what, Rachel, I like your “everyone has to take as many bites as their age” better than my “three bites” rule! That would mean that a six or seven year old would pretty much eat what was served, and as they got older would become more accustomed to a variety of flavors. Going to recommend that for my grandchildren. If Rachel can share recipes in this format, I am really interested in that Leek and Lemon Pasta with chicken! Also, I am a little confused–was it “Cream Cheese Chicken” or Cream cheese chicken and veggie soup”? Not sure if that is one dish or two, but Cream Cheese Chicken sounds intriguing. Was just re-reading these and noticed the query about whole grain risotto. “Risotto” is very good made with barley instead of arborio rice and I have seen a number of recipes for “risotto” using quinoa. I buy it like that because my youngest daughter is the only one that really likes it that much. I think it is okay, but I will eat any fruit and she is very picky so I have to buy the few things she likes. I think it is very interesting to compare, as I work my way through your 2 challenges, the prices on the East Coast vs. the West. I saw you quote shrimp for $1/lb?? Amazing! If we find $4/lb. that is awesome for here! And I was shocked seeing your 2 lb. bag of onions for $3 – ours are a quarter of that price! You’ve mentioned a couple times that you don’t like greens, but we sometimes do a quick supper of soft polenta with sauteed collard greens (or kale, or chard, or spinach…) Here in the south we call it grits ‘n greens. Of course they are better with onion, too, but you can sautee with garlic and finish with a few drops of balsamic. It’s a satisfying dish by itself but if you have some cheese for the polenta and a couple scrambled eggs to top it off, it’s even better.